I joined in on Sarah Ahearn Bellemare's online workshop Pages and Paint back in July. 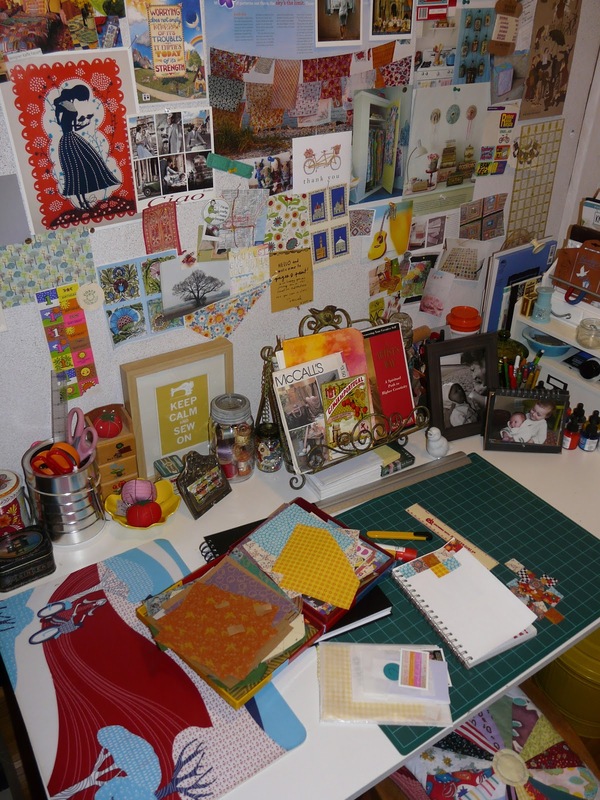 One component of her workshop found us creating, or, in my case, switching up and adding to, an inspiration board. An inspiration board is, quite simply, a collection of things which inspire, and appeal to you. Sarah's inspiration board was the wall directly beside her workspace. She used tape that wouldn't damage the paint and plastered stuff up that way. Other's had a small bulletin board, or even a shelf. The "boards" of each person in the workshop were a wide array of sizes, shapes, and styles. The beauty of this goodness, is that it doesn't require a huge amount of space. A small piece of wall, or shelf will suffice for your little collection of happiness! My current one has space for all kinds of bits, but as we are planning a house move, my new home will call for a much smaller version. That may be tough, whittling down all my favourite paper ephemera... I suppose I'll just need to update it more often! It would be so easy to have a huge wall of inspiration, the problem is having the time and energy to do some of the things. From this it seems you like a lot of colour. I love looking at people's inspiration boards. I guess that's what makes Pinterest such a fantastic place to visit.